Hector Munro died at Lochend Rangag 5th March 1910 aged 77. 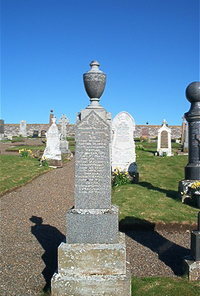 Wife Johan Macgregor died 23rd March 1916 aged 65. Son Donald Munro died 15th April 1912 aged 34. Son James Munro died at Capetown SA 14th November 1905 aged 23. Son Hector Munro died at 10th March 1955 aged 68 husband of Jessie Macgregor. Son Charles Munro died at Bignold hospital Lybster 15th November 1944 aged 66. Daughter Jessie Munro died at Glenorchy Kennoway Fifeshire 1st November 1937 w of Walter Simpson. Daughter Isabella Munro died at Hawkes Bay New Zealand 9th April 1942 wife of Donald McGregor.